The all-new Elddis Envy 196 is a superb low-line 6-berth with electric drop-down bed over the large front lounge. In addition, it features a family-size kitchen and bathroom amidships and a lovely light rear lounge which makes up into a huge double bed. The 196 has six dedicated seatbelts so the whole family can travel in safety. The all-new Tribute T726 is a new layout for growing families and the second model in the expanding Tribute range offering up to six berths and six travelling seats. The innovative layout incorporates a spacious front lounge seating up to seven, an overcab double bed and a pair of full size bunk beds. The 636 combines a large rear lounge and a front half dinette with two additional forward facing seat belts for extra passenger carrying capacity. The rear lounge can be used a two 6ft twin, or one transverse double bed. Providing luxurious fixed bed accommodation for couples, while doubling up as a spacious family multi-berth is what the Imala 734 is all about. In Lo-Line configuration it’s a dedicated couples’ van with plenty of living space and two generous fixed single beds in the rear bedroom. In Hi-Line guise, with an extra overcab double bed and a half dinette behind the cab seats, it’s a genuine four berth with ample living space for the whole family. This season’s RS is 85cm longer than its predecessor. An L-shaped kitchen together with a tall, slim-line fridge freezer creates additional space for a much larger rear washroom and an extended lounge area. This new model offers spacious touring for two or four in a versatile layout with extra carrying capacity. There is a 4ft 6in fixed rear bed with a roomy front lounge on an AL-KO chassis with uprated 4250kg GVW to create a versatile long distance cruiser with huge carrying capacity. Storage space can be further increased by specifying the high bed option, creating sufficient space for electric bikes or a mobility scooter under the rear bed. This brand new Delaware ‘S’ features an AL-KO chassis and two luxurious fixed single beds. There’s a central washroom, separate washroom cubicle and kitchen, completed by a lounge at the front. This two berth model is part of the revamped Autograph range of all-white, low-profile coachbuilts with their smart green and black detailing..The 75-2 (7.5m, 2 berth) has a French bed in the rear nearside corner, a washroom in the offside corner and a parallel lounge at the front, which converts into a double. It is 3500kg. Kit levels are impressive with new Fiamma Awning, 100w solar panel, gas BBQ point plus Italian made ‘Aero style’ overhead lockers. The media pack/media pack plus adds items such as digital TVs, reversing cameras, sound systems, lounge speakers and touch screen navigation. 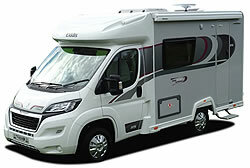 This four-berth model has a French bed in the rear nearside corner, a washroom in the offside corner and a half dinette up front with a pair of forward-facing travel seats on the offside. The Autograph 79-6 offers a front and rear lounge plus a drop down bed above the front lounge diner. External styling has seen plenty of changes including a new sun roof, flush fit windows and revamped graphics. The rear boasts a new moulding that looks more upmarket with bar-style LED rear lights. Bike rack fixings and media pack are standard. Come to our show on 22nd & 23rd October to view 30 of the brand new 2017 models to the market.